okay, went sliding again last night. You never let anything, anyone hold you down. The fastest on Cal, and always looking for ways to get faster..
No words can express how much it hurts. drifting, dirt, track, streets; they’re all so much fun. love corollas. she’s been through 3 motors. original motor ^^ (still sitting in the corner of garage awaiting rebuild). Did not treat this motor all that well. Did stupid things like run no air filter for a few months, didn’t keep track of oil changes, forgetting to shift when driving the back roads (*bouncing rev limiter). Im really sentimental with Lola, and feel bad about all that. So rebuild will commence once I get my fill with the current motor. Picked up from a friend. 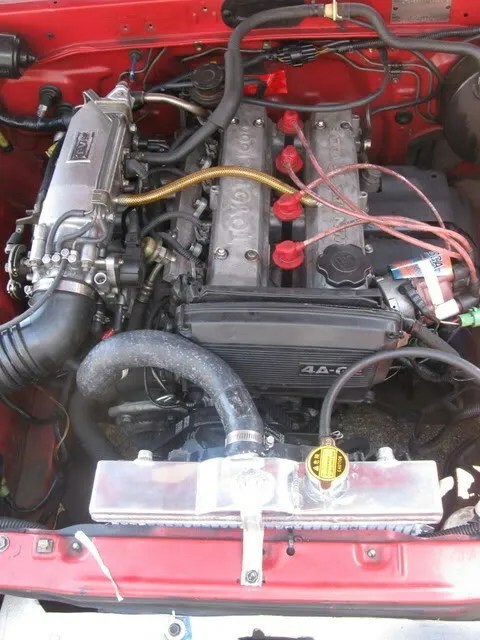 It was a ae101 block with high comp pistons, shaved head, trd HG, fancy nick nacks. unfortunately the motor blew a few pistons on me about 3 months after install. =/ oh well, thats how things can go with used motors, never can really tell what can happen. none of those symptoms were there at time of purchase, compression all good at purchase, even test drove it. oh well, corolla lyf. ae101 block, high comp pistons, untouched bluetop head, oem hg. nothing too fancy. plans? keep in mind this corolla in the end will turn into my weekend fun car once i get out of college with a real job, and a more luxurious car. So im just building it up to that point where im satisfied with it. short term though: angle, head work done to skimmed bluetop head, trd HG, fancy rear end stuff, track events, roll bar, jdm-ness. welcome to mike yee’s blog. where i will document stuff here.